Nico Jamin entered the first Cooper Tires USF2000 powered by Mazda race of the weekend with a 17 point lead and after driving what he called a “perfect car” to a dominating performance, his points lead over Jake Eidson will be almost double. It is the sixth overall win and fifth win in the last seven races for the 19 year-old native of Rouen, France. Eidson started the race beside Jamin on the outside of the front row, but he was passed by Aaron Telitz and Anthony Martin going into Turn 4 on the second attempt at at start. Telitz made it two wide and Martin, the Australian rookie made an aggressive move to the outside to make it four wide. The three drivers made it through the first turn cleanly with Martin filing in behind leader Jamin. The top 10 at the end of the first green flag lap were: Jamin, Martin, Telitz, Eidson, Parker Thompson, Yufeng Luo, Garth Rickards, Luke Gabin, Ayla Agren and Keyvan Andres Soori. Luo was the biggest mover, gaining four positions from his 10th starting spot. On the third lap of the race Team Pelfrey teammates Luke Gabin and Garth Rickards were battling for position and went side-by-side through the Carousel (Turn 12). It appeared that Gabin used a little too much curb on inside at corner exit which launched him into Rickards who nosed his Mazda powered No. 83 into the barriers. Rickards did not appear to be very happy with his teammate and it could be a very interesting evening in the Pelfrey camp tonight. The track went green again on Lap 6 and Jamin was able to quickly build his lead to one second. Telitz was able to pressure Martin and explained that he did try and make some moves in places you wouldn’t normally pass because he didn’t think he’d be able to get by Anthony in the normal passing zones. Telitz, a 23 year-old, said he could have “put a wheel” to Martin, but that wouldn’t be very nice. Matin chuckled his agreement and said thanks. Ten minutes before the race it didn’t look like the Rice Lake Weighing System sponsored No. 3 of Telitz would make the race. The Wisconsin native sustained heavy left side damage after a spin and wall contact in Turn 9 in the last few minutes of qualifying the Cape Motorsports with /WTR had to thrash right up until the the cars were called to the grid. Telitz hit the concrete wall flush with both wheels. Both rims were destroyed, the brakes needed to be replaced and the suspension mounts on the engine blocks broke. 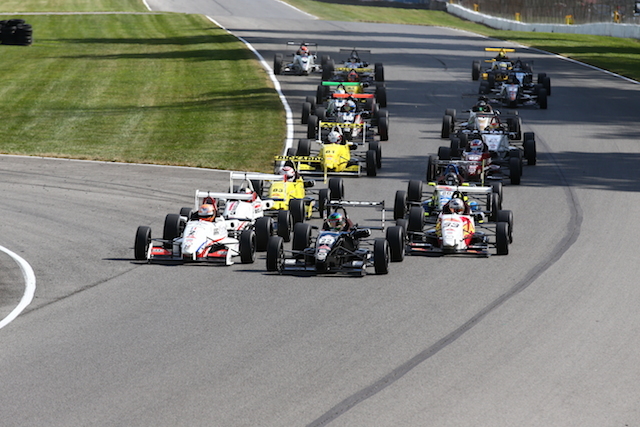 The four USF2000 newcomers faired well in their Mazda Road To Indy debuts. Afterburner Autosport made their return to the series and 19 year-old Sennan Fielding was able to score a maiden to score a ninth place finish after holding off a determined Ayla Agren. The Chesterfield, England native was warned for blocking early in the battle but was able to defend successfully against Agren for the remainder of the race. Fielding’s teammate, Jack Mitchell drove a solid race to finish in the twelfth spot. RJB Motorsports and their drivers Clint McMahon (13th) and Alex Meyer (15th) had a solid and uneventful debut in the Mazda Road To Indy. The second and third Cooper Tires USF2000 powered by Mazda races will take place tomorrow at 9:50am and 6pm.